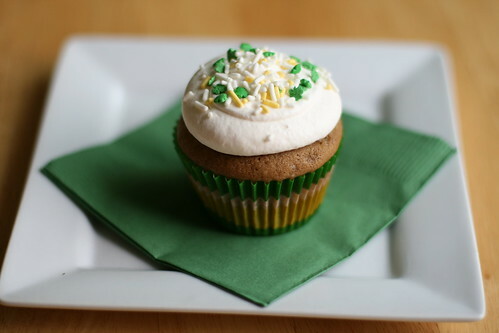 A few weeks back I was trying to come up with a St. Patrick’s day themed cupcake. I was eventually inspired by a coffee creamer commercial, oddly enough. The one for alcohol free Bailey’s flavored coffee creamer. I thought that would a tasty cupcake. And I had Bailey’s from past cooking (I don’t drink. I don’t like taste of alcohol). I finally settled on a Bailey’s cake with chocolate covered espresso beans with a mocha frosting. 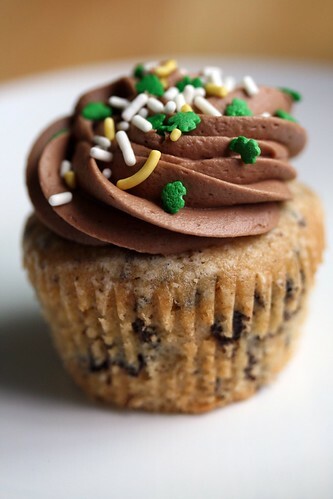 These cupcakes are in my top five favorite. And my husband paid me the ultimate compliment when he said it kind of reminded him of his favorite Ben and Jerry’s ice cream, From Russia With Buzz. Don’t try to find it, it’s in their flavor grave yard much to my husband’s despair. Lately I haven’t been able to take many pictures of the cupcake making process. My 1yo makes it hard to take my time while making them. He enjoys pushing me away from the counters and demanding my attention. He’s cute so I’ll keep him. See all those pieces of chocolate covered espresso beans? I was hesitant about the frosting recipe being all that good. Let me tell you: best frosting ever. The original recipe calls for instant coffee dissolved in a splash of water. I wasn’t going to buy instant coffee for one recipe when I have a perfectly good espresso machine. It turned out so delicious. I think it would be great on a lot of different cupcakes. 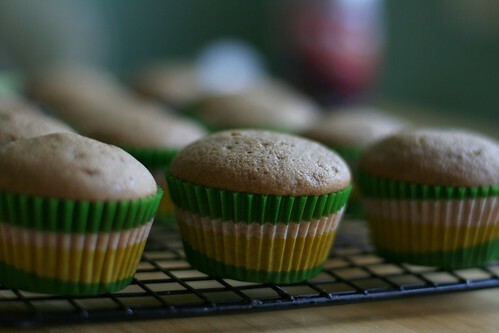 Preheat oven to 350 degrees F. Line a muffin pan with paper liners. In a medium bowl, cream together the sugar and butter. Beat in the eggs, one at a time, then stir in the vanilla. Combine flour and baking powder, add to the creamed mixture and mix well. Stir in the Bailey’s until batter is smooth. Add the crushed chocolate covered espresso beans. Fill liners 3/4 full. Beat the softened butter with the powdered sugar until it is creamy. I’m typing this up with a snoring husband on my right and sleeping baby on the left. And the first quiet I’ve had all day, as well as the first time I’m able to sit down at the computer. So this is going to be a day late and a dollar short but I baked and dang it all, I’m gonna blog it. 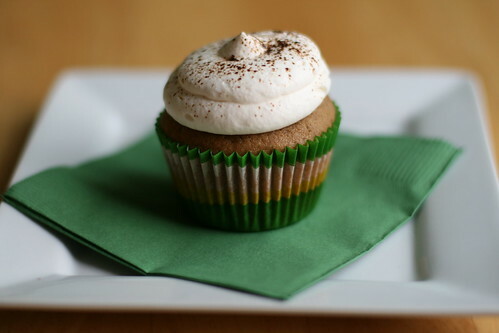 I was googling around for some St. Patrick’s day cupcakes when I found Martha Stewart’s Irish coffee cupcakes. 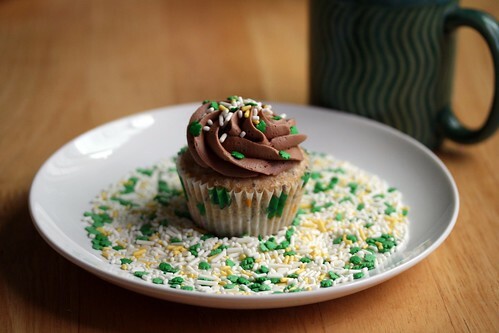 I like coffee (or well, lattes) and I like cupcakes so I figured it was win win. I’m going to tell you right off the bat I did not like these cupcakes. First fail from Martha for me. 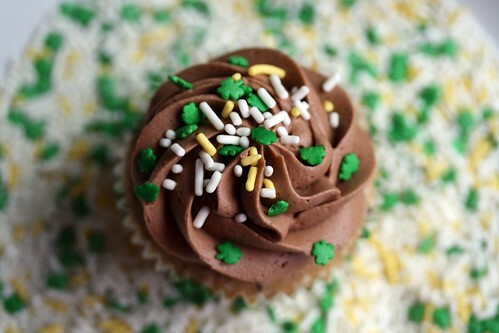 The cupcakes are very very simple to make. It calls for instant espresso. 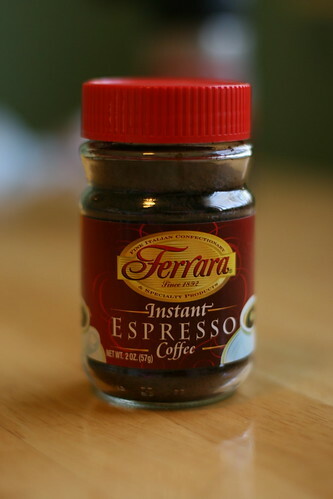 You can find it in with the other instant coffee in a tiny jar for a lot of money. I wasn’t sure I needed to use instant, thought about just brewing a strong cup of espresso but decided I might as well follow the recipe. I should have went with my gut because I think real espresso made from great coffee like the local place I get it from would have made for better cupcakes. I was expecting a really strong coffee taste with two tablespoons of instant espresso and I just didn’t get it. “Brewed” it looked pretty strong and it certainly smelled good. But the taste just wasn’t there. 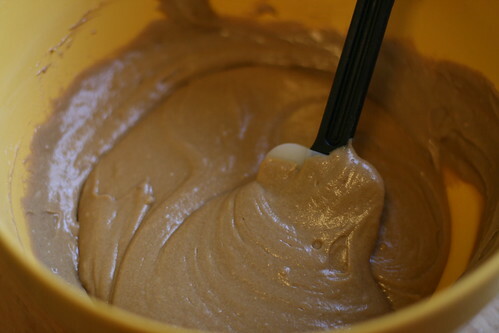 The batter is this really rich looking brown color. Similar to what coffee ice cream looks like. I tasted it at this point and knew it wasn’t going to be great. While they were baking again I knew they weren’t going to be great. I kept expecting the aroma of coffee to fill my house and it just didn’t. I tasted one while still warm and thought to myself maybe the whiskey whipped cream would make it all come together. Nope. Maybe there is a better instant espresso I can find? Maybe Martha has a can of great stuff and when she cooked them they were rich and flavorful. But as my 4yo said “they don’t taste like anything”. Preheat oven to 350 degrees. 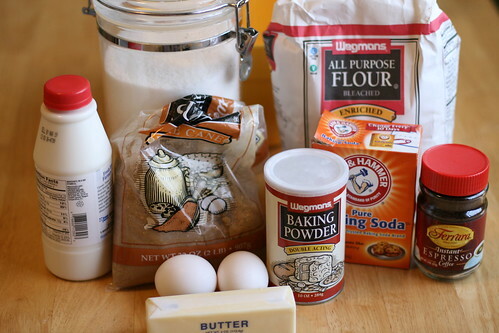 Make the cupcakes: Whisk together flour, baking powder, baking soda, and salt. Pour water over espresso powder; let cool. Combine espresso with milk. Beat butter and granulated and brown sugars with a mixer on medium speed until pale and fluffy, about 3 minutes. Add eggs, 1 at a time, beating well after each addition. Beat in flour mixture in 3 additions, alternating with espresso-milk mixture, beginning and ending with flour (batter may look broken). Make the frosting: Whisk together cream and confectioners’ sugar until medium peaks form. Add whiskey; whisk until slightly stiff peaks form.